There are many facets to Donnie McClurkin, and in a small crowd, it's rather easy to find strong advocates for any of them: minister, choir director, songwriter, soloist. Now on The McClurkin Project, he brings yet another creative force into the mix. 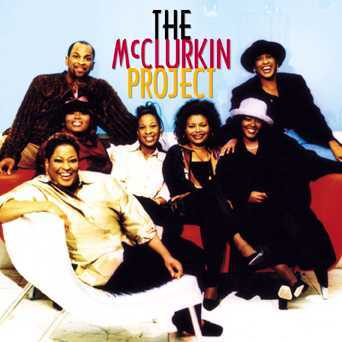 The McClurkin Project is a nine-member vocal ensemble formed by Donnie McClurkin in his native New York in the late 1970's. As a close-knit group, they formed the nucleus that went on to become the New York Restoration Choir. Comprised of Donnie, his four sisters and four close friends whom he refers to as "just like blood sisters", this vocal force debuts with a self-titled album on GospoCentric. With production from both Kevin Bond and Steven Ford, the emphasis of this collection is on vocals. McClurkin does much of the arrangements, which are characterized by tightly-woven, flawless harmonies and masterful blends. It's the stuff that family (or near-family) ensembles are renowned for. While McClurkin's instantly-recognizable vocals are featured often, this is truly an ensemble project. Other leads come from Olivia McClurkin, Sherry McGhee, Sheila Ravenel-Carpenter and Andrea McClurkin-Mellini. The approach to song taken by the group is exemplified by "Holy Unto Your Name". With a lead from Olivia McClurkin, the cut takes on a harmony-based praise and worship vibe. The melody is original, but also contains elements of the undefined familiar. There's a similar feel to the two prayer-based cuts, "Healing Grace" and "Oh Lord Have Mercy". Both are smooth, slow and impassioned blends of outpouring to God. Kirk Whalum lends his saxophone stylings to the latter cut. There are a few more uptempo selections included, with the two standouts being "It's Alright" with lead from Donnie McClurkin, and also "Every Beat of My Heart". Remakes feature prominently on the project. There's a McClurkinized "Hallelujah Chorus", which takes on Handel's famed Messiah chorus. There's also a remake of the Walter Hawkins classic, "Is There Any Way", which features a superb pairing of guest soloist Tramaine Hawkins with Donnie. It's the album highlight, and an intriguing contrast of vocal styles. There's also an interpretation of the 80's hit "Cry For Help", originally from UK pop/soul/dance sensation, Rick Astley. This remake isn't as effective however, and quickly fades from memory. With a highly-anticipated solo project due for release in 2000, Donnie McClurkin is certainly a voice to keep an ear tuned for, and The McClurkin Project is a fine example of his work. It's also a solid ensemble album worth checking out.